Pores. Whether large or small, how we wish we could just make them vanish. After all, how can we achieve a completely flawless looking face if they’re staring right back at us through the mirror? Sadly I have to be the bearer of bad news for you: the size of our pores will never change. Sure we can find products that will make them look smaller, but all of that is temporary. There is no permanent or completely long-term solution to making our pores disappear just like that. Plus, as we get older, they’ll only get bigger. For now, the best thing we can do is use makeup to minimize their appearance. 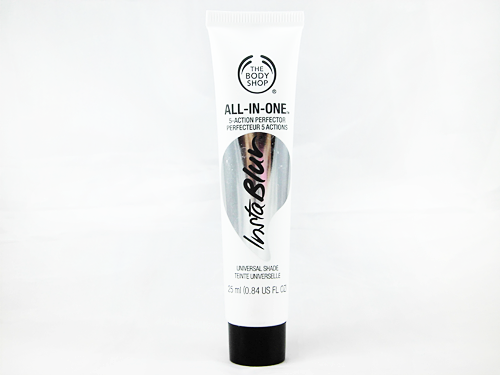 For that, I decided to try out The Body Shop’s new All-In-One Instablur 5-Action Perfector! Product info: This all-new face perfector blurs imperfections, giving you flawless photo-perfect skin in an instant! With Community Fair Trade marula oil. Blur creams are all the rage now, and more and more brands are releasing their own version with TBS being one of the latest to do so. Before receiving this I had only tried one blur cream and that was Kiehl’s Micro-Blur Skin Perfector. I was very impressed by it so that means I had high hopes for this product too! Note: I didn’t take into account Benefit’s The POREfessional since it’s not really classified as a blur cream, just a primer. Wait, what’s a “blur cream” you ask? It’s all in the name already. Blur creams are meant to ‘blur out’ or minimize the appearance of pores and any blemishes on your skin to fake a smooth, flawless complexion. The Body Shop’s InstaBlur is meant to act as a primer also so like most primers it promises to make makeup last longer, as well as control oil for up to 12 hours. InstaBlur is packaged in a simple squeeze tube containing 25ml of product. I like the minimalist design they went with, black and white is always a color combination that gets a thumbs up from me, and the unique mirror finish as part of the logo. Normally I don’t like a lot of white with my makeup products since it’s prone to dirt and stains, but since this product is colorless (it’s dubbed as having a ‘universal shade’) then I can’t complain. InstaBlur’s texture and consistency is like your average silicone primer. It’s lightweight, but I find it to be a little on the drier side. It’s almost clumpy, but not quite. 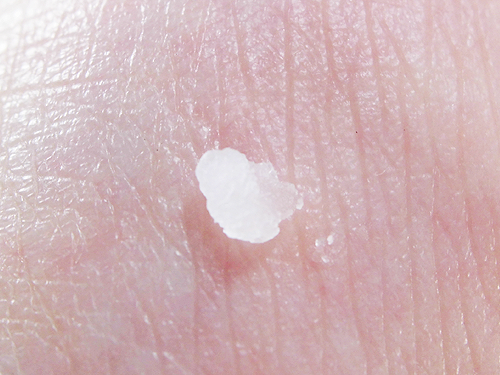 To let you better understand what I mean, I have to be careful when squeezing this out of the tube because when I try to ‘cut’ the product away from the tube after I’m done squeezing, the usually pea-sized ball of product sometimes rolls right off my finger. Here’s InstaBlur in action! As I start to blend the product out you can see it’s already blurring or diffusing the appearance of the lines on my hand. The product leaves skin with a matte, powdery finish but at the same time isn’t drying. Also, it has no scent for those of you out there with sensitive noses. For me, working with this product takes some practice. It’s best to warm it up between your fingers or on the back of your hand first so it’s easier to spread. Like I said earlier, the fact that’s a bit ‘dry’ and clumpy means this is pretty much a necessary step. You can use a brush to blend this out on the face, but I find like with most primers, fingers are still your best tool. Also, wait for your last used skin care product, like your moisturizer or sunscreen, to really absorb into your skin first before priming with this or else you might find it’ll ‘ball up’ and just basically roll around on your skin instead of spreading out properly. The same applies if you use too much of this all at once. Don’t worry, this is the case for me with most silicone primers actually! What I like best about The Body Shop’s InstaBlur is how it leaves my skin feeling smooth after applying which in turn makes my foundation or BB cream go on nicely and more evenly. Unfortunately I’m not such a fan of how it mattifies my skin because as someone with combination skin that leans more towards dry, I prefer a dewy finish instead. The fact that I tend to use foundations or BB creams meant for drier or combination skin, which purposely makes the complexion shine up a bit more, means it eventually cancels out the whole point of this product that’s supposed to help control oil and keep your face matte. In relation, I didn’t see a big improvement in my makeup’s longevity. I’m sure if I paired this with a good setting spray then I’d be able to see my makeup last a little longer than usual. Lastly, the product did manage to blur out the lines on my hand as you saw earlier, but did it do the same for my pores and blemishes? Not so much. It did minimize the appearance of my pores, but barely. My blemishes also looked no different. After trying this out for the first time, I read Nikki from Askmewhats.com’s review on it and she did point out that if you had larger pores or more defined lines on your face, the product won’t be able to blur them out completely. I do have very large pores, so I’m afraid that’s the case for me! Not to fret though. If you’re lucky enough to have smaller pores, then this would definitely be a good primer for you as the blurring power would be just right. Oily-skinned individuals will love this too I’m sure because it really does leave skin matte after just one application. Makes skin feel smoother allowing makeup to go on better and more evenly. It has a lightweight feel to it. 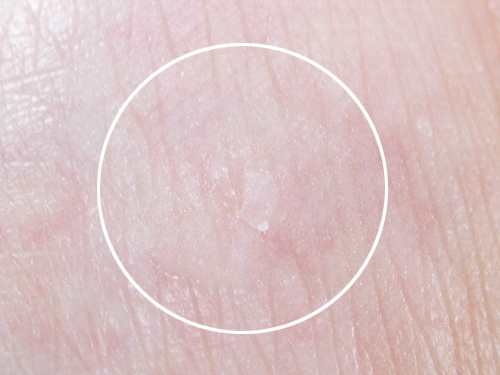 Does not cake up on the skin even after applying multiple layers. It mattifies skin. As someone with combination skin that’s mostly on the dry side, I need and like my skin dewy and glowing. 25ml isn’t exactly a lot of product, especially if you have a combination of large pores and oily skin and need to apply quite a lot of this daily. If you’re going to be using this as a full-face primer, I’m sure this will run out quickly. It’s hard for me to comment on whether or not this controls oil well, particularly if this keeps me shine free for 12 hours, because I often use makeup meant for dry skin. As a result, the makeup purposely makes my complexion dewy and a little shiny. What do you think of blur creams? Have you tried any? If so, what’s your current favorite?